UNITED COLLEGE under UNITED EDUCATION FOUNDATION was established by a team comprising of experienced academicians, devoted educators, professors and entrepreneurs with the main objective of providing outstanding education with culture and etiquette. Strictly adhering to its motto “Education, Civilization and Mankind”, UNITED wishes to become a centre of learning for young students who are determined to meet the challenges posed by the increasing pace of scientific achievements and modernization. UNITED teachers and staff work together to provide students with the best education possible – in the best possible learning environment. UNITED aims to provide the type of education that meets the individual and collective needs of students and make them self-confident, self-disciplined and self-reliant by stressing value education, computer learning, social guidance, leadership training and other extra curricular activities. Established in 2058 B.S. as the higher wing of the triumphant United Academy,United College (UC) is centrally located at Kumaripati, Lalitpur. The college is established to offer courses on business studies and humanities through a scientific and discipline approach. The college affiliated to the Tribhuvan University runs Bachelor of Computer Application (BCA), Bachelor of Business Management (BBM), Bachelor of Business Studies (BBS) and Master of Business Studies (MBS) in an unrivalled environment. The college strives to equip students with the latest insight into the competitive world by making them more sensitive, sensible and responsible. United College is not just a college in literal sense, rather a college in fact in that it embodies and uses all the necessary infrastructures both physical and academic to their fullest extent in order to enable the students to face all sorts of challenges and problem. 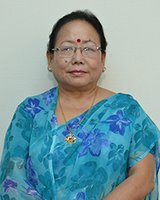 Message from Prof. Pramila Rai, Ph.D.
United College (UC) welcomes our new students in Bachelor Programs: 4 year program in Bachelor of Business Studies (BBS). On behalf of United College, I would like to express my commitment that we are firm in our goal and the promise that we have made to students, parents and guardians, who have entrusted us with education and future of their children. From 2005, UC has extended its program to Masters of Business Studies (MBS), as a natural corollary to out graduate programs which are running very successfully. All these programs are affiliated to Tribhuvan University, Kathmandu, Nepal. Moreover, I would also like to inform our parents and guardians that UC is a part of United Education Foundation. UEF symbolizes quality, excellence and discipline in education sector. United Education Foundation incorporates education system from the pre-primary level to post graduate levels. We want to assure you once again that your children/wards are in safe hands and we respect your trust. UC has its own cafeteria supplying food and soft drinks to its students.Prices of the food items are reasonable. The café is well furnished and has a clean and healthy environment. It provides boiled and filtered water to students to avoid any water borne diseases or other health risks. The college provides hostel accommodation having all modern facilities. The hostel has a good study environment. Students needing additional assistance in their studies are provided extra tutorials. Students can enjoy facilities like good food, spacious bedrooms and equipment for physical fitness and exercise inside the hostel. The college provides transportation facilities to students living in Kathmandu, Bhaktapur and Lalitpur. Students at United College can utilize the exclusive medical facilities available within the College. First aid facilities are on stock for the emergency treatment.